We looked at every team’s Reddit thread to find out. Baseball teams have a way of dragging their fans’ moods with their fortunes on the field. It’s no fun to root for a perpetually losing team, especially if its performance seems unlikely to improve. Conversely, an unexpected contender has a way of lifting one’s spirits. But wins and losses are much easier to measure than happiness. We do have a proxy, though: the masses at Reddit. I scraped comments from each team’s subreddit1 on the website and determined how happy their comments were.2 To do that I used sentiment analysis, collecting the words used by each fan base to determine their overall level of joy. More positive words (“win,” “wow,” “wonderful”) point to a happier fan base, and more negative words (“unimpressed,” “miserable,” “wrong”) suggest the opposite. There are some caveats, as there always are with sentiment analysis. The word list I used was calibrated to a sentiment analysis of Twitter — it’s possible that language is used differently on Reddit, and so the sentiment scores may not be as calibrated to the medium as they would be if we had Reddit-centric sentiment scoring. For example, the word “damn” is rated as strongly negative, since it is usually a negative exclamation (“damn, we lost again”). However, it can also be used in a positive sense: “damn, that was our fifth straight win, we are pretty good.” And maybe people on Reddit “damn” more positively than the hordes on Twitter. (The same can go for any word used atypically in any sentence, making its meaning different from how the algorithm interpreted it.) Also, people who write on Reddit do not constitute a random sample of a team’s fans. But let’s get back to the results. Hope springs eternal in the offseason but is extinguished for many fan bases by July.3 That makes sense given how many teams don’t have any hope left. In the preseason, only one team — the Phillies — had playoff odds less than 1 percent, per FanGraphs. Now, 11 teams have odds less than 1 percent. Sentiment scores per word — our index of happiness — tended to be between 0.3 and 1 on the sentiment scale in the offseason, indicating that the average word was a positive one (between a neutral word and the word “agreement”). Nowadays, the same scores have plunged. Clearly the grind of the MLB season wears on the fans’ happiness as it does the players. Every fan base lost some of its happiness from the preseason, save one: the Chicago Cubs, who increased their sentiment score by a bit. The Cubs have not only been contenders in the crowded National League Central, they have also seen a number of top prospects called up, most notably Kris Bryant (but also Addison Russell and Kyle Schwarber). Not only are the Cubs contending a little earlier than expected — the future is even brighter. 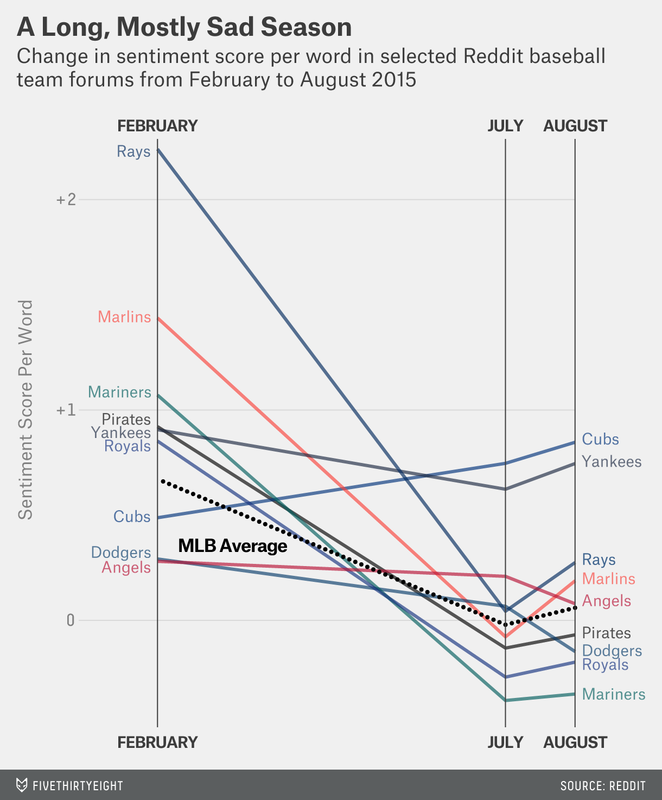 All other teams’ fans have become much less happy since February, but not all by the same amount. The change in sentiment score from February to July is roughly in proportion to the change in playoff odds of each team.4 Teams that made strides in their playoff hopes such as the Yankees, Angels and Dodgers have seen the smallest declines in sentiment since February. At the other end of the spectrum, teams such as the Mariners, Athletics and Padres have seen their playoff odds tumble. Their fan bases also have had some of the most pronounced declines in sentiment scores per word. From July to August, sentiment scores were steady, fluctuating about four times less than they did from February to July.5 The trade deadline didn’t seem to do much to move the needle in terms of fan happiness, but the teams that did gain are mostly the ones you’d expect: the Blue Jays (who strengthened their roster enormously), the Cardinals (who locked down a playoff spot) and a few others who were riding winning streaks. On the other side, the Tigers lost happiness, witnessing their championship window close and their highly regarded general manager leave. Although on-field success can buy happiness, it doesn’t seem to work for every team. The Royals have gained the most playoff probability of any team since the preseason, but they lost the fourth-most happiness from the offseason to July. There are any number of potential reasons6 for the relative grumpiness of Royals fans, but one may be that fans were more optimistic about the Royals than the projection systems. While contention in Kansas City may seem surprising to sabermetricians, it may not to Royals fans who were riding high off a World Series appearance. Conversely, failure on the field isn’t necessarily enough to dissuade a happy fan base. The Phillies, hopeless since the beginning of the year, nevertheless have fans who aren’t that much sadder than they were before the season. Despite the loss of erstwhile ace Cole Hamels at the trade deadline, fans have gotten happier since July — his trade and others signaled a shift in direction for the team toward rebuilding. As above with the Cubs, fan bases seem to not only weigh the present but also to consider the prospect for future improvement. There are also some inexplicable cases such as that of the Rays, whose fan base declined in sentiment much more dramatically than their playoff odds would lead one to expect. It’s possible that the Rays’ 4-8 slide in July before the All-Star break had something to do with it, or the seven-game losing streak from June 28 to July 4. The streaks, winning and losing, may play havoc with fans’ emotions, causing people to see false patterns suggesting imminent decline in what is mostly random fluctuation. Obviously, we’re grasping for answers as to why fans are happier or sadder as the season goes by. But the general trend seems to be that a complex calculus of current performance and hope for the future dictates how happy each team’s fan base feels. Of course, it all resets come March. Hang tight, Reds fans. Only a few more months to go. Using this script to get text from specific subreddits. In technical terms, the valence of each subreddit, or how positive it was. To do this, I used the AFINN-111 word list, which was assembled by Finn Arup Nielsen in 2011. All measurements come from three time periods: one preseason (Feb. 15 to March 15), one pre-trade-deadline (June 15 to July 15), and one crossing the trade deadline (July 15 to Aug. 15). The correlation coefficient is r = -.3, which is not quite significant. The Pearson correlation value was a strong .746. Including the All-Star controversy, an injury to their star player (Alex Gordon), and enmity from other teams/fan bases.